Just a quick post this evening to document our Halloween 2016 for our future memories. I've spent the afternoon planning a little party for the kids and Lauren's friend, before we headed out to 'Trick or Treat' on our estate. 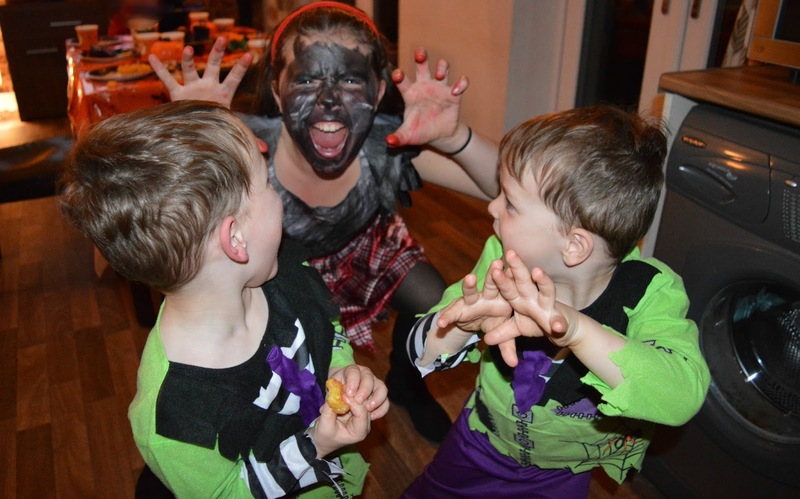 'Trick or Treat' is always a very sociable and friendly affair where we live. All the neighbours are out with their kids and the houses that are taking part, go to a lot of effort to join in. I look forward to it each year. So this year went a bit like this. Lauren - you were a werewolf. You didn't like how you did your face make up and had a bit of a moan about it all. Harry and Matthew you dressed as mini Frankensteins, but wouldn't keep your masks on, as expected. Matthew - You told me about 100 times that you love Halloween. Harry - You insisted on taking 2 things out of everybody's treat bowl, because you 'wanted two'. I told you lots of times to take one. You both said ' Happy Halloween' to everybody at every house - don't know where you got that from, but it was cute. You now have enough sweets, between you, to last until selection box season! And the best bit - You didn't need a pram and you didn't run off - Hurrah! Progress! A few pictures from the 'party', before we headed out. Before you all came in! Harry, you took a shine to the teddy pumpkin!